Amazon's cold war against Steam continues—Prime members can claim the Dark-Souls-crossed-with-Zelda game Titan Souls anytime before May 24. If you haven’t heard by now: Twitch is giving away free games to anyone with a Twitch Prime account—by which I really mean “Anyone who has Amazon Prime and then linked it to Twitch for the novelty.” Hard to tell whether the program will stick around or be one more gimmick in Amazon’s war against Steam, but the upshot is free games so I’m not complaining. 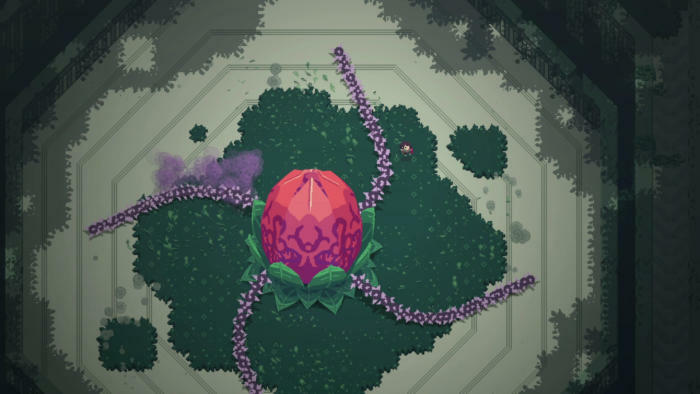 The latest freebie is 2015’s Titan Souls. It’s like an old Zelda game if Zelda consisted of nothing but 15 or so boss fights. It’s like Dark Souls if Dark Souls were top-down, and if you were forced to fight with only a bow and arrow. It’s like Shadow of the Colossus if Shadow of the Colossus were on the Super Nintendo. It’s a good challenge, though not without some problems. The game’s designed for you to die repeatedly while trying to figure out each boss, but instead of quickly getting back in the groove it makes you retrace your steps a minute or more to the arena. Not the best pacing. But it’s free if you have Amazon/Twitch Prime, and really that’s more than enough reason to check it out. Head over to Twitch’s homepage and if you’re logged in and a Prime member you’ll see a crown in the top-right—click it and you’ll see the free game offer. Or you can click here, which takes you to the game’s Twitch page where there’s a prominent “Claim” button. Don’t forget: These free games are installed through Twitch’s desktop app. It’s not just giving you Steam codes. (An important distinction for some.) And the promotion only lasts until May 24, so be quick if you want to take advantage.